When you partner with SquadLocker, you're getting branded team gear backed by the best names in sports equipment today. We're not selling cheap knockoffs; we've got the exact same gear that the pros use - but ready for your team's branding. Let's take a look at one of the best and most popular football shoes on the market: The Under Armour Highlight MC cleats. These are shoes worn game after game by some of the most successful players in professional football, including Kyle Fuller, Aqib Talib, Ryan Mathews, and Eddie Lacy. What Makes The UA Highlight MC Football Cleat Different? There are a lot of things about the Highlights that stand out to us, but perhaps the most obvious -beyond the eye-popping styling- is how incredibly lightweight these are. These are super-high tops that weigh less than 11oz, lighter than even many low-top runners! Because, of course, the lighter the shoe, the more performance your athletes will get out of every step. And the Highlights are all about increasing performance in every possible way, which is part of the reason they're becoming popular among pro players. Under Armour is constantly at the forefront of sport's gear technology, and the Highlights show off many of their top innovations. One of the more notable elements of the shoe is the cleat arrangement. The bottoms are rather unmistakably styled to look like a foot's inner structure, and that's definitely no mistake. By arranging the cleats on a molded high-tech PlasmaX Plate to match the exact anatomy of a player's foot, they can precisely mimic and extend the foot action down to the turf level. Each precisely-placed cleat digs in exactly where the foot would if it had cleats. Things are just as advanced on the inside. UA's ClutchFit design takes the same body-hugging material used in their garment products and uses it to create a "second skin" sleeve that perfectly hugs the athlete's foot. Combined with their revolutionary slim-line 4D Foam, it exactly matches the contours of the foot to create an unparalleled fit that makes the shoe feel like an extension of the body. Top-side, the 3D molded tongue is also layered with 4D Foam on the interior, ensuring a great fit all around. Plus, UA's own patented V56 Technology keeps toes safe and secure, helping prevent hyper-extensions even in serious down-and-dirty play. Simply put, there are few football shoes on the market which are more comfortable to wear, or do more to protect the player's feet against injury. 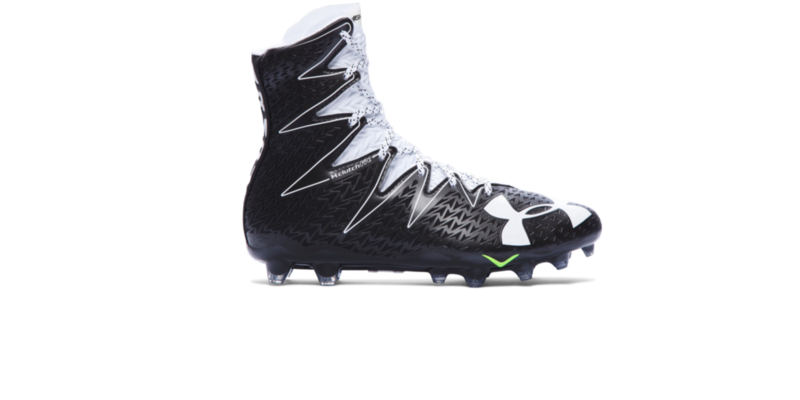 When combined with UA's advanced cleat technology and super-durable low-weight skin, you've got a shoe that truly can stand up to the roughest of football games.